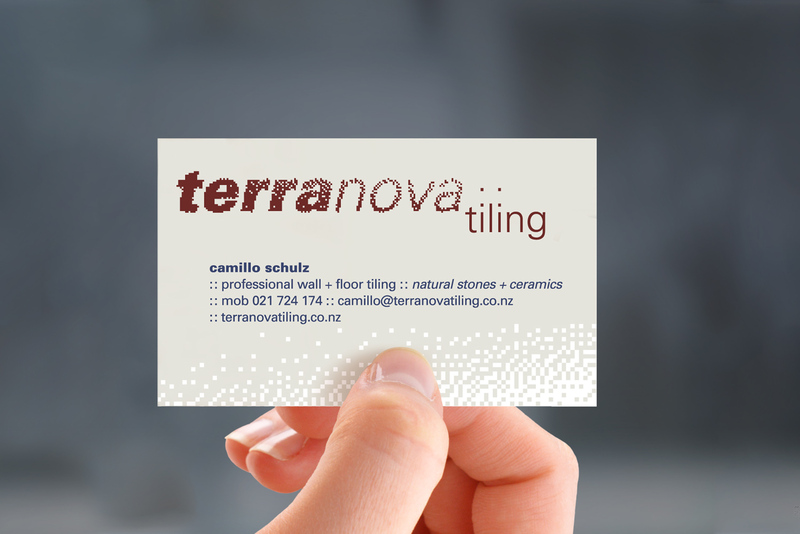 Terranova Tiling is a firm of tile installation craftsmen headed by master tiler Camillo Schulz. Camillo was trained and worked in Germany for ten years before emigrating to New Zealand in 2001. Terranova traces its history back to 2003. I designed the Terranova logo and a business card for Camillo when he launched the firm in 2003 and designed their brand new website (along with back-end assistance from NuWeb) in 2015. During the briefing of the website Camillo paid me the professional compliment that the Terranova logo design was perfect as it was, and that feedback from his customers and business associates assured him branding remained as contemporary today as when it was first designed. 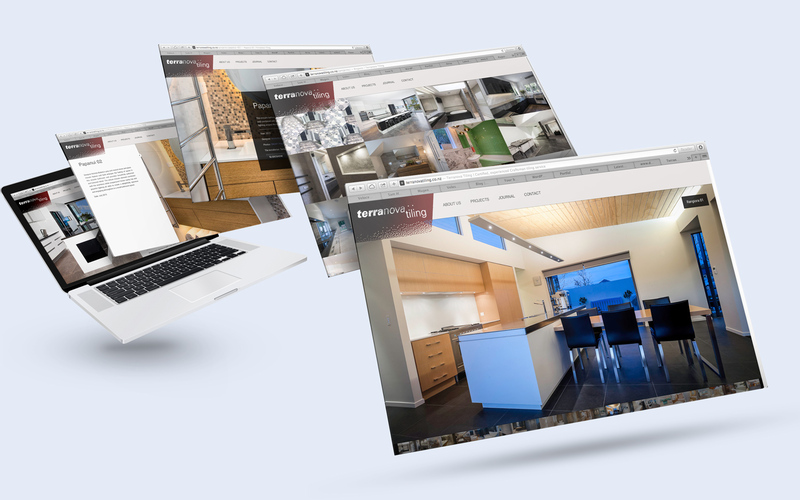 Part of the reasoning behind the web design was to encourage the client to set about obtaining high quality originals of the imagery of his work that had appeared in various architectural, building, and interiors magazines and that had been shot in the course of being entered into bathroom and building awards by his clients, dating back to 2007. 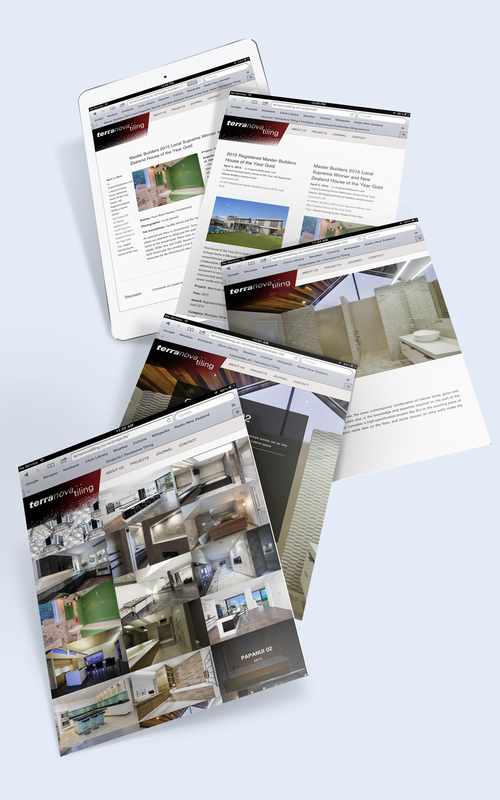 Terranova’s faultlessly accurate tiling craft showcases the geometry and art of architectural and interior designTerranova’s work has been recognised by his industry peers for many years as award winning so it made sense for the web design to be centred on quality imagery of the work. It was reasoned that this would appeal to their discerning ultimate clientele of homeowners, many of them affluent, and to the architects and interior designers who in pursuit of the best architecture design projects centre on stylish interiors. The flex imagery of the full-screen slider of their best work on the homepage creates a strong and memorable first impression centred on the utmost quality of Terranova’s work. The purely visual landing page was a conscious strategy to first show, not tell. The Projects page tiled Mosaic unfolds an elegantly staged, lean presentation of the client’s work. It is also designed for best optical appeal with its pared-back aesthetic and pragmatic descriptions and credits. The overall result is a minimalist design feel that is plain speaking, direct, and showcases their work functionally and beautifully. Web design for attention and information. Photographs are storytellers by their nature—they are the windows into Terranova Tiling’s world. By grouping photos this characteristic is intensified to great advantage. Grouped photos create an environment which draws a reader’s undivided attention. The achievement of catching the interested customer’s eye is impressive. And it’s free. Next the reader clicks the image that catches their eye through to the short descriptive text about the project that has already caught their attention. They drill down to the project slideshow to engage with the project in detail. 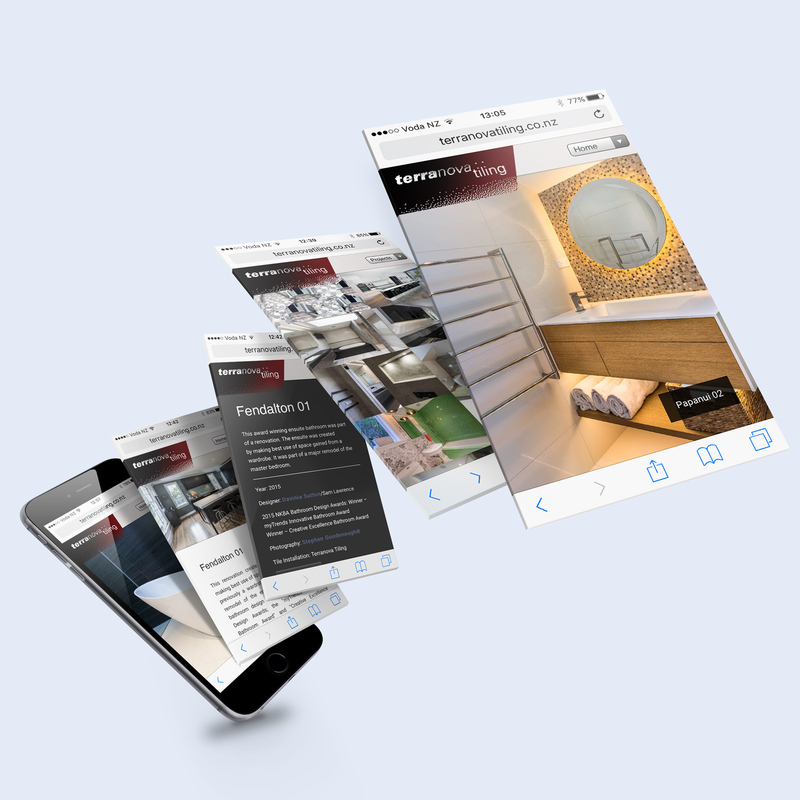 The Journal/blog provides the objective documentary evidence to back Terranova’s claims of expertise and and industry benchmark standards of finish (whilst serving the need to update the site content regularly in order for it to continue to rank consistently well in the search engines). 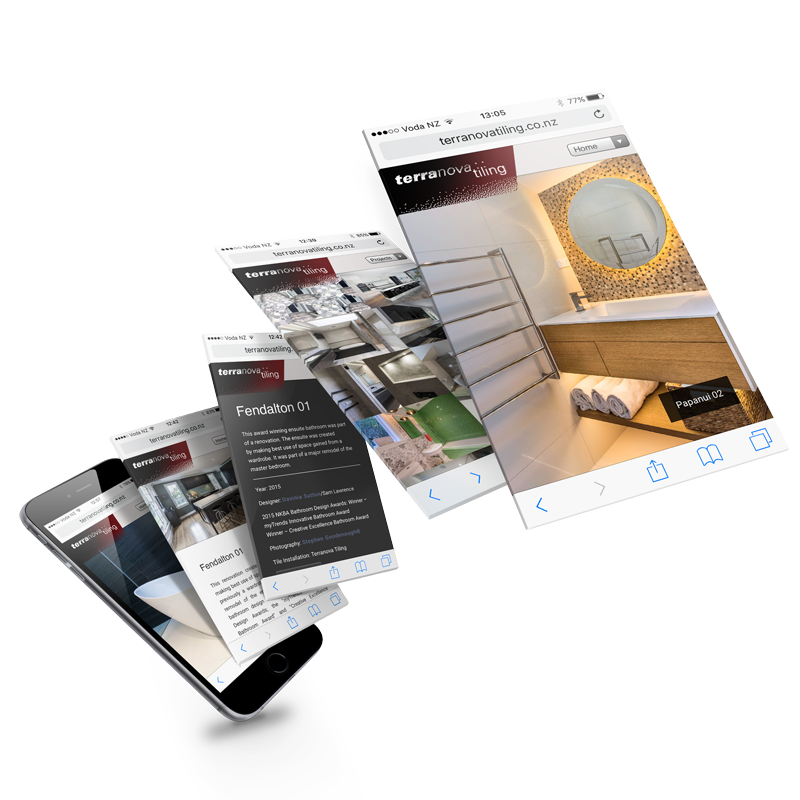 A significant amount of research and image processing love went into this web design project as well as thorough domestic and international research into appropriate keywords and phrases to ensure the site is search engine optimised. I’m looking forward to updating the site again shortly with Terranova’s 2016 crop of Master Builders’ plus Kitchen and Bathroom awards. The website is responsive and I took great care with the design to ensure that it will age well as Terranova commissions me to add more and more great news items to the Journal awards showcase, and fantastic award winning projects to the Projects’ mosaic. Previous Post: Case studies for Civil Engineering firms. Why are they so beneficial?